Diptyque, the world leading scented candle brand. A little something that will sit proudly on the mantelpiece, petite yet powerful. This little candle, will permeate the room with its unique scent. Their notorious, simplistic, yet poignant branding is iconic. Immediately recognisable. Like most elegant things, it speaks for itself. Now, Diptyque has released a new concept. Scent pairing candles. This offers a truly subversive element to scent. They’ve taken the concept of layering in perfumery, and applied it to home ware. Genius. 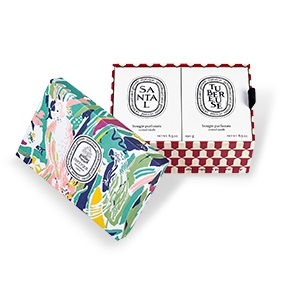 To introduce the scent pairings, Diptyque have created five limited edition set duos all decorated by Maison Pierre Frey, the storied French fabric and wallpaper House. The idea is to choose two candles, enjoying pairing them and instantly reveal an olfactory landscape, reinvented with each new combination. The new concept of perfumes includes: A Moroccan Garden, Memories of Asia, Beneath the fig trees, The artist’s drawing pouch, The Flower Festival. This gives the aromas of a traditional Moroccan villa. Lanterns are surrounding the courtyard. Smoke rises from the narghile, a traditional pipe. Tall palm trees cover the tobacco honey-like scent. Combined with a floral scent of Lily, to encapsulate an evening in a Moroccan garden. Sandalwood/Tuberose: Memories of Asia: The heady scents of lush jungle foliage… The memory of a trip to Asia, with its fragrant flowers and tree trunks hauled by mighty elephants. The woody, velvety scent of sandalwood is heightened by the heady, green accents of tuberose. Cyprus / Figtree: Beneath the fig trees: This scent is meant to replicate the Greek Islands in summer. The hills above the Mediterranean. The wind blowing, the green, woody accents of the fig trees blend with the notes of the cypress trees. 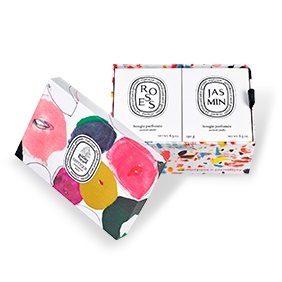 Leather/Violet: The artist’s drawing pouch: Diptyque’s founders always kept a leather pouch filled with artist’s supplies nearby. The traditional scents used here, leather and violet mirroring the traditional habit of Diptyque’s founder’s carrying a leather pouch. A festival held annually in the South of France to mark the start of spring. A variety of blossoms, the festival also has a flower battle, filling the air with thousands of multi-colored petals. This scent uses the main flowers of fragrance, roses and jasmine. Purifying the senses, and bringing everyone that lights the candle to this festival metaphorically. 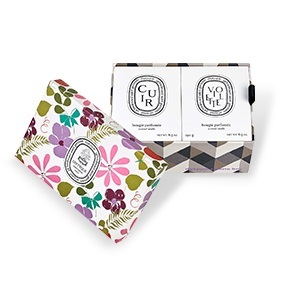 Diptyque’s creativity focuses on appealing to the senses through a constant interplay of colours, patterns, and scents. 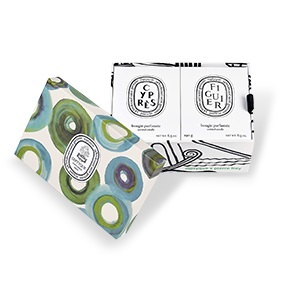 Diptyque’s latest collaboration with Maison Pierre Frey involves Diptyque choosing fabrics and prints from their collection to illuminate the olfactory world of each candle. The collaboration with the House of Pierre Frey’s creation beautifully encompasses the creative drive behind the product. The concept of a duo fragrance, pairing two scents creates an immersive experience. It attacks the senses leaving the person feeling as though they are truly there. How will you choose to pair your candles? With your mood? Or perhaps, even your dinner? Set the tone with Diptyque’s new pairing scent candles.